What an experience. I was away at a conference this past week. Some friends and I have a tradition of bringing some unusual wines to this conference and tasting them together. This year was extra special. I got to taste a wine that was older than I. This was the oldest wine I have ever tasted. 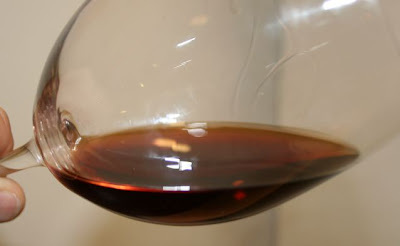 I’m talking about a 1964 Rioja Gran Reserva from the great Conde de Los Andes. When a wine is this old you are not sure what to expect. It is a delicate thing at this stage of its life. To think I was opening a bottle that has been sealed for as long as I have been alive. 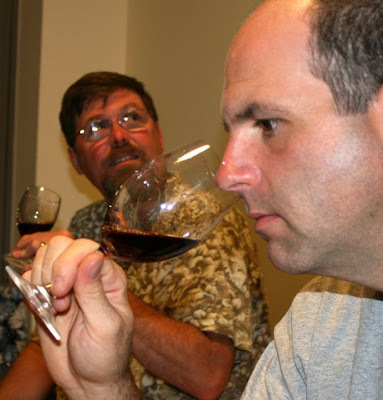 Regardless of how the wine tastes, it is truly like drinking history. I can’t describe how amazing it is. When the foil was removed and we saw the cork underneath we were just a bit concerned. 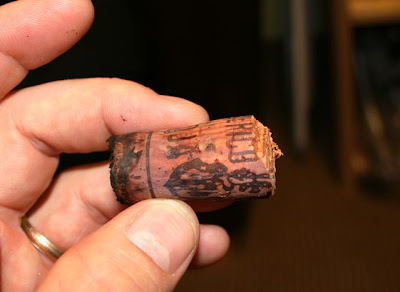 The cork was completely blackened after decades of standing still. 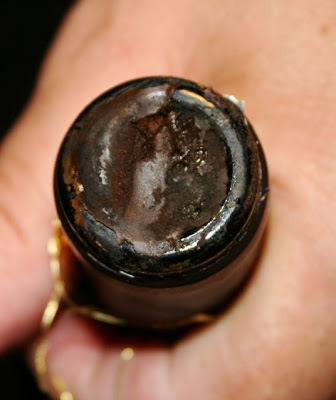 The black residue is likely lead tartrates produced from wine seeping through the cork and reacting with the all lead foil. Very carefuly the corkscrew was inserted into the delicate cork. Twist after slow twist pushed the screw deeper and deeper into the bottle. Oh so gently the cork was pulled from the bottle. I don’t think it would have mattered how gentle we were. That cork was destined to fall apart. Yes, it did break leaving a plug in the bottle. Surprisingly the cork looked quite good. It had kept it’s integrity over these forty plus years well. Carefully the remaining cork was skewered by the corkscrew and lifted from the neck. After all these years this rioja finally met air. Into a glass it went. The color was brown, of course, but it had a surprising amount of redness remaining. After a quick swirl I brought the glass to my nose and inhaled deeply. Sherry acetaldehyde and earthy notes hit my nose like a sledge hammer. There was no fruit present. I could tell that it was still wine. There were no odors that would indicate spoilage, only oxidation. As I lifted the glass to my lips I couldn’t help wonder if the men who picked the grapes ever realized their efforts would last so long. I wondered if the winemaker who produced this wine was still alive. I wondered what the countryside of Spain looked like as the grapes were crushed. I wondered who carefully filled these bottles and sealed them with the cork that we just broke. The wine hit my palate and I was delighted. Well, the wine wasn’t great. I would say it was 15-20 years past its prime. Ok, so I’m making up that number. I think it might have been good at 20 years old but I may be wrong. No, I wasn’t delighted by good taste. I was delighted to find the wine was still wine in one form or another. In our old age we all get wrinkled and stained from years of toil. We may not be attractive on the outside but we have wonderful wisdom of the ages on the inside. That is how I thought about this wine. The fruit was depleted long ago. It still had a good acid but it tasted a bit flat. Left behind like a rotting corpse was a wine tasting of forest floor and age old compost. It was earthy and pungent. It tasted a lot like chewing on a brown paper bag that had been dumped in the compost bin. It was not offensive. I think that’s about all you can ask of an old timer like this. Truly an experience that I will remember for a long long time. Thank you Richard.